Vegan Cooking Tips, hints, and information to help make recipes even better. When cooking Use ONLY soy milk with just water and soybeans on the label any other added ingredients can alter the flavor. Never use a whipped, tub margarine in place of stick margarine or shortening in baking! Tubs are mostly air and water and will alter most recipes! 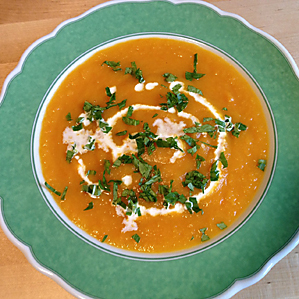 If you don't have a broth powder, you can use a little garlic powder,onion powder, and a little salt. Use the freshest ingredients and spices. 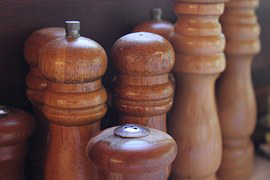 Get rid of your pepper shaker, and put a pepper grinder on your table! Makes all the difference in the world! If you aren't familiar with Nutritional yeast... become! It is another great flavor enhancer you can add to many foods! Find local farmers markets in your area and support them! Try growing a few pots of herbs like basil, thyme, chives... A little snip added to the top of your plate adds color and lots of flavor. Use Olive oil or Canola oil for frying or baking when you can. Look for old fashioned cast iron frying pans and use it all the time! Besides being naturally non stick once it is seasoned, it actually will add iron to your food! Add wine at end of cooking for best flavor and Don't Boil wine in foods, simmer gently. Acids and vinegars will hurt metals such as copper, zinc, aluminum, iron, so use glass if possible. Add soy flour with oils. Roast and crushpoppy seeds for more intense flavor. Before Baking Sweet breads, brush with oil and sprinkle with sugar. Brush with fruit juice for more flavor too. To harden and gloss breads, brush with cornstarch and water several times. Use a potato masher to crumble tofu. Rinse pasta in cold water right away if you won't be coating it with sauce right away, to prevent sticking. Reheat quickly by dunking in boiling water for a minute. When using rolled oats in place of quick oats in cooking, add a little more liquid and sit for 20 minutes longer before baking. "We are the living graves of murdered beasts, slaughtered to satisfy our appetites. How can we hope in this world to attain the peace we say we are so anxious for? " "The time will come when men such as I will look upon the murder of animals as now they look upon the murder of men. "